I am back in the Mothhouse, for the last time this year. 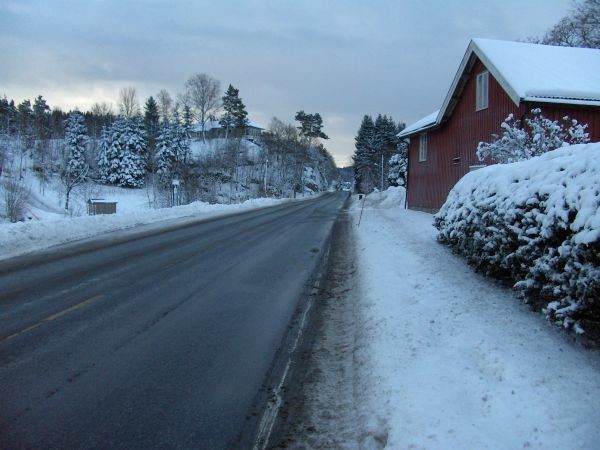 Tomorrow is New Year’s Eve, and once again almost all of Norway comes to an abrupt halt early in the afternoon so people can start preparing for the celebration. So I better remember my mobile phone this time. It keeps growing colder. I can feel it right here and now. Yesterday when I had been burning wood for a while, the electric heater turned itself off. Today it doesn’t, even though I keep the stove as hot as I reasonably dare. (I don’t want to leave the house with the stove literally red hot.) But it really is uncomfortably chilly, even with both the stove and the space heater. And yet it is less cold here than at Nodeland. When I left the house there this morning, my nostrils started freezing shut. This only happens when it is below -13C (=+8F). It may have been slightly colder than that again, but probably not much. At this level you can also get an idea of the temperature by listening to the sound of the snow as you walk on it. Meanwhile back at the Mothhouse, the bathroom faucet now only runs cold water, ironically. The shower has neither. The kitchen sink has both, but the pure hot water is little more than lukewarm. Even after running for several minutes, it is still not too hot to touch. That’s kind of disturbing. I turned up the electric radiating heater in the bathroom, as it was a bit chilly in there. Not nearly chilly enough to freeze water, mind you. Even in the central hallway, the one with the stairs, it is not below freezing. I store the cola there, and it is very much liquid still. I could probably store pretty much any food there – the temperature is about ideal for a refrigerator, from the feel of it. I don’t like to leave the house with the heater at max, since it is closer to the ceiling than I would have wished. The ceiling is painfully hot to the touch, and there is a dark stripe across the ceiling just over the heater. But at least it is not smoking or smoldering even after an hour… and I don’t want to risk the water pipes bursting from ice, flooding the place. I am between a rock and a hard place here. I can’t shake the feeling that this must be a design flaw. You should not have water pipes freezing when the house maintains a temperature not far from what it would if people lived here on a daily basis. Even if I lived here, I would still not be tapping water for about 8 hours during the night and about 10 hours during the workday and travel. Â If you have to leave the hot water running when you are not there, it is definitely a design flaw. Perhaps I should bring it up with the landlord. Or I could buy a couple more electric space heaters, I suppose. It’s not like I can’t afford the utility bill. I just don’t like it. You should definitely ask the landlord about this. Sounds like a hot water heater problem, possibly unrelated to the external temperature . . . but what do I know? Other than the fact that you should definitely ask the landlord about this, of course. That I know.